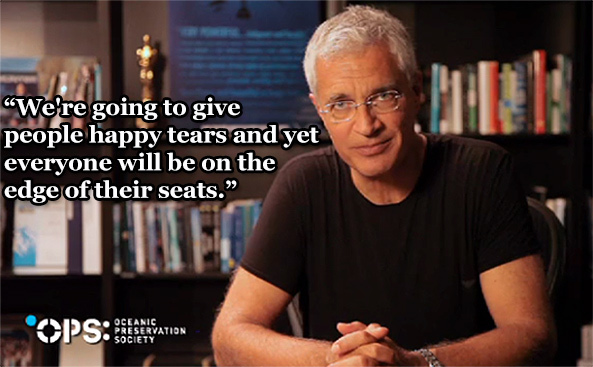 Back in 2009, director Louie Psihoyos shook up the world of documentary filmmaking with “The Cove” – a film that combined the best of animal activism with cutting edge technology and edge-of-your-seat thrills. Beyond winning the Academy Award for Best Documentary, the movie did what all documentary filmmakers hope to accomplish: build awareness and influence change. Today, Psihoyos is putting the finishing touches on his next documentary – an eco-thriller he says will engage even more than “The Cove” and give audiences a real-life “Avengers” movie experience. We recently talked with him about this new project, what new spy gadgets we can expect, and when we might actually see it premiere. Ecorazzi: Based on a successful Kickstarter campaign last year, we know your new film focused on the very huge subject of mass extinction. How hard has it been to make the shift from something narrow like “The Cove” to the fate of species all around the world? Psihoyos: I actually began the film I’m working on now before The Cove and got sidetracked when I discovered Ric O’Barry. And I’m glad I got sidetracked because I’m a much better filmmaker now. I look at The Cove as a warm-up. I think that film was one of the most beautiful but heart-wrenching documentaries ever made, but we kept people out of the theaters in droves by having one ultra-dramatic sequence. I wouldn’t shave another frame off that film but with the new one we won’t make the same choice. We’re not making a film about mass-extinction, we’re making a film about an unlikely team of activists coming together to prevent a mass-extinction. I tell people our next film is like The Avengers, but it’s real. It’s really a buddy film, but like The Cove it’s an eco-thriller. I’m intimately aware that on Friday night at the cinema our audience has been working all week, they are going to spend a hundred dollars or more on dinner and a movie and at the end of the night a woman wants to see a film that will make her feel and a guy wants an adrenaline rush, an action movie, and to maybe get lucky. We’re going to give people happy tears and yet everyone will be on the edge of their seats. I still can’t believe we’re doing what we’re doing. The last four years we’ve been creating a film that I want people to throw down their hard earned money and feel it’s the best money that they ever spent. Ecorazzi: We’ve heard very little about the next film since the Kickstarter. Where do things currently stand? Does it officially called “The Heist”? – and might we expect a showing this year at film festivals? Psihoyos: The Heist was always just the name of the final act of the film. In the final mission of The Cove where we penetrated that natural fortress getting past police, guard dogs and sensors using all of our high-tech surveillance gear, drones etc, we called it Full Orchestra as kind of a code name. 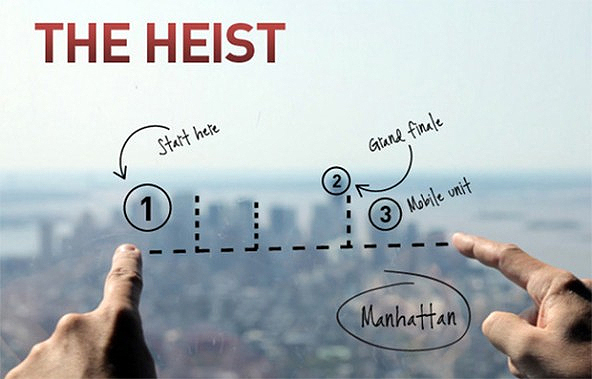 The Heist is the working title of the film but that’s just what we internally call the final act. We just screened a rough cut of the first 75% of the film for a big festival, I shouldn’t say which one yet but there wasn’t a dry eye in the house. Let’s just say the ending will be spectacular, like nothing that’s ever been done before. Ecorazzi: How was the technology used in “The Cove” evolved for this latest project? Can we expect some new spy gadgets? Psihoyos: My non-profit company is the Oceanic Preservation Society, but we call it OPS for a reason. We have a Director of Covert Operations and everyone on the core team is fluent with undercover gadgetry. The film is a result of watching too many Jacques Cousteau specials and James Bond movies. The opening scene feels like a Bond opening. The technology illuminates the message though. 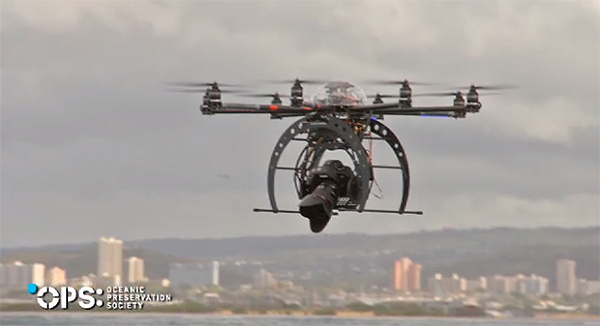 There will be images that we capture with some of these gadgets that change the way that people look at the world. Ecorazzi: “The Heist” appears to be focused on New York City. Why did OPS choose the Big Apple? Psihoyos: It’s a global story. We travel all over the world but we end up in New York for a very good reason. If we do our job right you’ll know when we’re there and why. Ecorazzi: You’ve mentioned before that you want this next film to do more than inform and entertain – you want it to spark a movement and “change the way people think about the environment.” How will it build upon and improve what other documentary films in the genre (11th Hour, An Inconvenient Truth, etc.) have tried to do in the past? Psihoyos: James Cameron told me to change behavior you can’t just educate—you need to change hearts and that’s what we try to do. We have an epic love story and the ultimate subject and we tell this story by showing people something they haven’t seen before in a way that hopefully changes their hearts forever. Our story unfolds like a mystery but quickly escalates into thriller mode. The exposition is delivered while you’re watching the thriller unfold so it doesn’t feel like a doc, it feel like, well like nothing you’ve seen before. I don’t know what the genre is but if we succeed it will be sitting on a shelf by itself. For insight into Psihoyos’ thoughts on “Blackfish” – and why he believes an Oscar win for the film would do significant damage to SeaWorld – head on over to MNN.com for Part II of our interview. The link to part 2 is broken!